Anyone that has savoured a USDA Prime Graded Steak knows that it is delightfully tender and juicy with a buttery flavour that makes it distinctively superior to any other American steak. Of all the beef produced in the US, less than 2% is certified as USDA Prime. The grading system determines the quality rating of beef based upon a very complicated inspection system which essentially measures the amount of marbling (fat specs) in the rib eye muscle (lean) portion and combines the maturity (age) of the beef carcass to arrive at the inspected grade quality. Basically the higher the ratio of marbling and the younger the beef, the higher the grade. 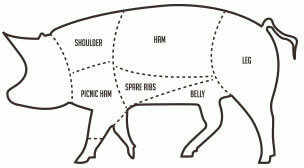 It is the fat marbling that determines tenderness, juiciness and flavour. 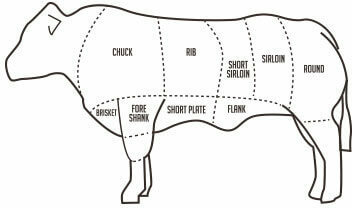 The age of the beef determines beef texture and also effects flavour. Younger beef produces a finer texture and a lighter red colour. Scottona is a young female bovine that has never been pregnant, and is not more than 15/16 months old. These two features are essential to ensure an ideal muscle development to provide beef of an exceptional and distinctive taste. Scottona meat is recognised by small infiltrations of fat in the muscle mass, known as marbling. During the cooking process, the marbling will melt thus giving the meat a delicious taste and the famed tenderness associated to this beef. Scottona owes its name to a farmer, who raised cattle, and was forced to lead to the slaughter a young female cow that had failed to impregnate and felt ‘scottato’ (burned) by this loss. The Cinta Senese breed of pigs owes its name to its black coat with a white belt (called a cinta in Italian) that runs across its shoulders, sides and front legs. Medium in size (adult pigs run between 160-200 kgs in weight), it has sturdy limbs, long ears that cover and protect its eyes from branches and a long snout with a very thick grout that allows it to dig in the dirt at ease. These characteristics allow it to live as a free range animal in the woodlands of Tuscany feeding on roots, truffles and wild mushrooms. When they reach two years of age, they are taken to the butchery and the fresh meats they provide are transformed into those products that are typical of Tuscan tradition that include salami, finocchiona, fresh sausage, seasoned pork loin, salt bacon, capocollo, cured lard, and the famous prosciutto. The products are cured in special rooms according to the length of time it takes them to be ready for consumption. This is a totally natural process, and in the case of the prosciutto, for example, it can last well over two years. The Cinta Senese meat was recently awarded the DOP classification from the European Community as a product of high quality tightly tied to tradition and is now listed among those culinary excellencies that render Tuscany and Italy so famous around the world.